Okay. So I got a little bored. 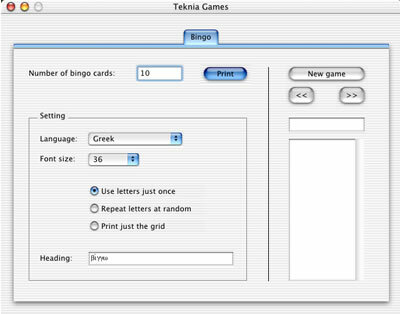 But students like playing bingo, so here is a free program that creates Greek and Hebrew Bingo cards. It is especially good at the beginning of the class when the students are working on the alphabet. Have fun. You must have the TekniaGreek or TekniaHebrew fonts for it to print properly. You can download a version for Macintosh and Windows. You will need the free Stuffit Expander to decompress the Macintosh and Windows version, or a zip program for the Windows version, like WinZip. You can choose how many bingo cards to print. It will only print on 8.5 x 11 inch paper. Choose between Greek or Hebrew alphabet and the size of the printed characters. You can also print the cards with English letters; for this you must have the font Palatino installed. What you enter in the "Heading" field will be printed at the top of the page. The right side of the screen is to help the teacher play the game by randomizing the appropriate alphabet. Click "New game" to start, and then the right button to move through the alphabet (or the left button to move backwards).